Chair enclosing a toilet bowl. 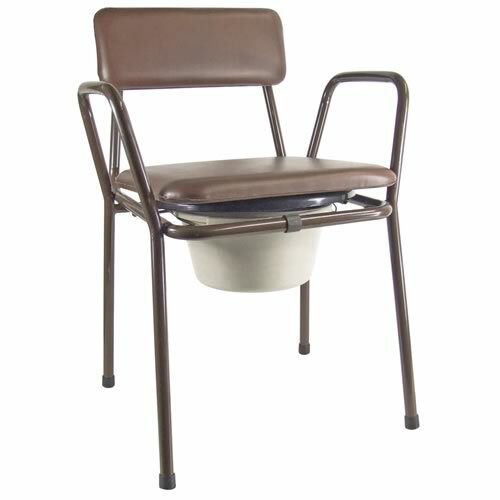 Used in treatment centres to enable the physically impaired to use the toilet. Commode has arm rests and protective seat cover. Note: Version with wheels includes foot rests. This is a toilet seat with a hole used with a container underneath, such as bucket. The contents of the container are then disposed of with other faecal waste. It is suitable for people unable to squat, but with some sitting balance e.g. wheel chair users, the frail, elderly, those with poor coordination, balance or with weak legs, and sometimes pregnant women.